There are many accomplished dyslexics who have told us that one of their greatest strengths in their current career is strategic thinking, but is there any evidence that strategy is a strength that is present in the school years, and if so, can it be better used to help students tackle the many academic hurdles that they face? Unfortunately, there has been relatively little attention studying the potential of strategy in the curricululm of dyslexic students, but there is some and in those studies, the findings are interesting. For instance, in study of LD students attending 4 Southern California universities, researchers sought to understand how students with significant difficulties in phonological awareness and word attack were able to do just as well as non-LD students in challenging college courses. So despite significant weakness in “word reading, processing speed, semantic processing, and short-term memory,” these students were able to be just as successful as their non-LD classmates. Wow. So LD students who consciously used learning strategies at college, OUT-PERFORMED non-LD students at college. Talk about a secret weapon! We need to make sure more students know this! Good for them! Interestingly other studies by researchers such as John Kirby, Therese Chevalier, Asha Jitandi, and others have shown the association between strategy use / instruction in LD / dyslexic students and strong academic performance. The MSLQ Inventory refers to the Motivated Strategies for Learning Questionnaire, which has been used in many academic research settings. To look at the questions that comprise this inventory, go HERE. It’s interesting for us to see that dyslexic students / LD students in this study scored significantly higher than their non-LD peers on the use of Critical Thinking strategies, especially as critical thinking is a higher order learning task that involves the application of knowledge to new situations. This finding resonates with us because often we have heard that older students interact or talk back-and-forth with a text rather than just ‘reading.’ Notably too, in Kirby’s study of successful college and university students with dyslexia, dyslexic students were also found to more likely to engage in a deep vs. superficial approach to learning. 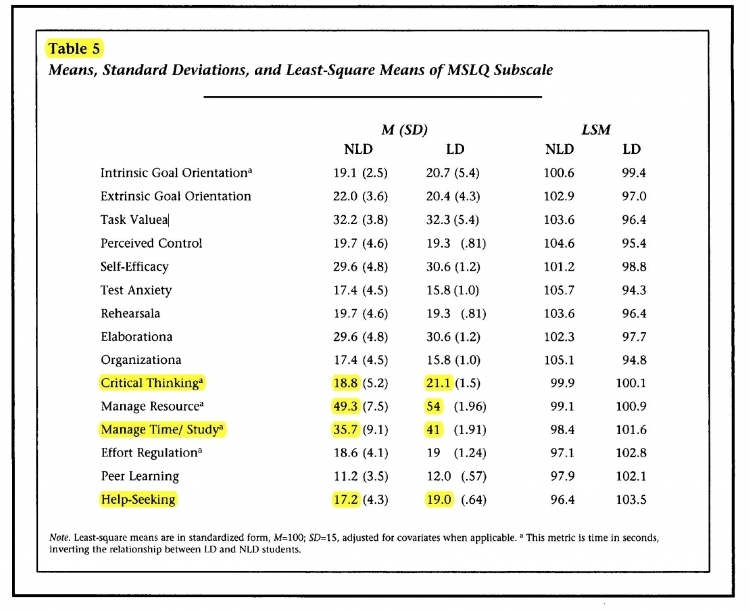 Notice also that these ‘successful’ LD students were more likely to ask for help and consciously manage their time. Thanks for details about this topic. So exactly how can we apply to implement the strategy learning disabilities students at home or school? And i also have one more question have there any advantage to include family/parents to school for dyslexia students? Hi Marion, These are great questions! Strategy games are another way to introduce strategic thinking, analysis, and more reflection!